The credibility of 15-year-old cancer survivor Gavin Arvizo and his mother Janet was key to the case against Michael Jackson, who has been acquitted of child abuse and abduction charges by a California court. The defence sought to portray the boy and his family as dishonest gold-diggers who saw Mr Jackson as a celebrity fall guy to be milked for cash. Janet Arvizo proved to be a loose cannon and one of the most explosive witnesses in the case with her erratic courtroom outbursts. The many faces of her son - downcast and ghostly in a police interview, or fresh-faced and confident in documentary footage - gave the jurors a compelling dilemma. But what emerged above all was a sad picture of a family fragmented, and of a teenage boy - still with serious health problems - laying himself open in a case seen all over the world. Gavin Arvizo comes from a troubled background. His mother remarried in 2004 - to US Army Major Jay Jackson - following an acrimonious divorce from her previous husband, 37-year-old lorry driver David Arvizo. Mr Arvizo lost custody of the teenager, his younger brother and older sister after admitting an assault on Janet Arvizo. The trial heard how the father was persistent in begging celebrities for money after Gavin was diagnosed with a rare form of cancer in 2000, which required the boy's spleen and left kidney to be removed. It was in that year that Gavin first met Michael Jackson, introduced to the star by Jamie Masada, owner of The Laugh Factory in Hollywood. Gavin claimed the abuse started after his appearance with Mr Jackson in the British documentary by Martin Bashir - filmed in 2002 and aired in 2003. He said it was after the interview that Mr Jackson started serving him and his younger brother wine, which he claimed the singer called "Jesus juice", and began making sexual advances. But defence lawyers were able to put a number of dents in Gavin's credibility as a witness. It emerged that the boy, and his younger brother and older sister, had taken acting lessons ahead of a 2001 lawsuit against US retailer JC Penney. The boy himself said Mr Jackson broke his heart by rejecting him as a friend, and defence lawyers suggested the accusations were a case of revenge. In separate interviews with a social worker and a teacher after the airing of the Bashir documentary, Gavin denied he had been molested by Mr Jackson. Prosecutors said this was because he wanted to put an end to the teasing he was enduring in the wake of the film. The low, downcast demeanour of the boy in a powerful video shown at the very end of the case, in which he haltingly described the alleged abuse, was a powerful boost to his case. 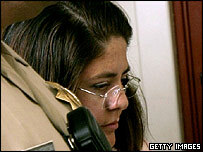 From the outset of the trial, Janet Arvizo proved to be a mercurial character. She rarely gave a straight answer to any of the defence's questions thrown at her in court, often replying using a repetitive array of words and phrases. Among her favourites were "It's burned inside my memory" and "Money doesn't buy happiness". At times she drew laughter from the courtroom - often directed at her - as in the time she tried to explain she was acting in the so-called rebuttal video. "You are not going to call Halle Berry and say, 'Are you Catwoman? '," she said in response to questioning. She was accused of exploiting her cancer-stricken son for money. Defence witnesses said she had concealed sources of income while receiving welfare cheques. It was also suggested that she spent $7,000 (£3,800) shopping and dining out at the same time as she alleged Mr Jackson kept her and her family captive. Now their claims about Mr Jackson's behaviour have been rejected by a jury, their motives for making the allegations against the singer will come under close scrutiny in the coming weeks.